Next week you won't even be suffering through Friday (long weekends, we love you!! ), so make the most of your last 5 day week for a while by wasting the day with some blargs from around the world wide web. It's almost Easter, which means it's time for us to throw off the shackles of healthy living and looking good naked and embrace chocolate in all its forms. 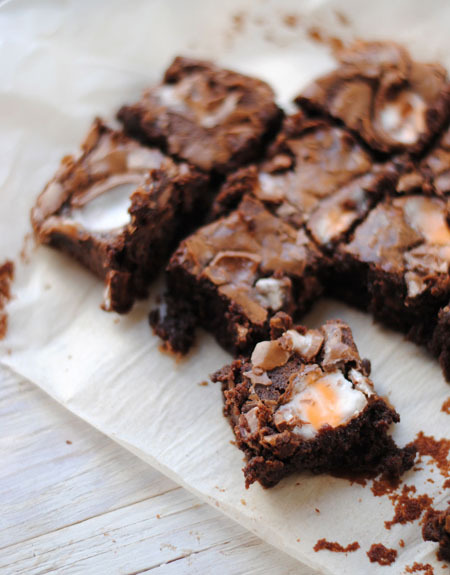 These Cadbury Creme Egg brownies should do the trick. Lindsay is trying to make "quiche" happen, like, a year after the rest of us thought it was funny. Thankfully her cultural sway is kind of limited these days. Naw. It's a video of a weally, weally tired French Bull Dog puppy that doesn't want to go to bed yet. Yes, this is as ridiculously cute as it sounds. It's one of those things that make no sense if you've ever watched That '70s Show, but, in real life, Fez is constantly pulling the ladies. The Daily Beast investigates the phenomenon that is Wilmer Valderrama. Game of Thrones came back this week, and some of us were pretty darn excited about it. Here's quite a geeky breakdown of the series return, for all you die-hards. And — good news for anyone who felt like a nerd dressing up for those Game of Thrones parties — here's some hard evidence that GOT style has made itself felt in the fashion world. Kate Middleton channels Jackie O, like we always knew she could. Girlfriend knows how to work a coat. And, in case you missed it, here's all the front-of-house and behind-the-scenes action from Fashion Week in Sydney (and here, and here). There were floral 'face wreaths', Victoria Secret angels, loads peacocking, and the midriff trend showed no sign of going anywhere. Put the Cadbury Creme Egg brownie DOWN.